If you're struggling to make ends meet, or are crushed by debt, it's not a great feeling. It's easy to feel despondent when you can't seem to get ahead financially. But don't get discouraged! If you make the right choices, things will come together for you and your money. There are many small things you can do to make yourself feel better about your financial situation. 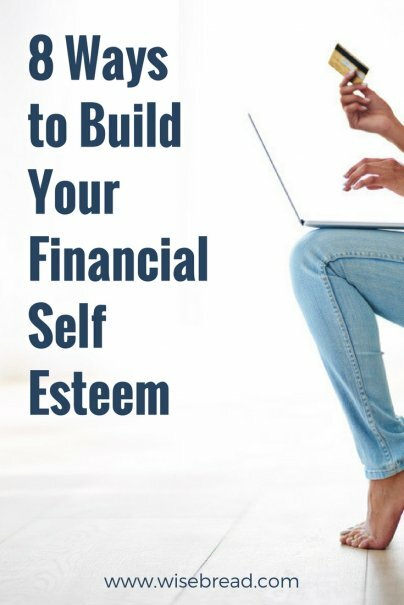 Try a few of these ways to give your financial self esteem a boost. Positive things will snowball from there. You may be battling a giant monster of debt from credit cards, student loans, auto loans, and more. And you probably feel pretty cruddy about it all. But you can give yourself a little psychological boost by targeting one credit card and working to get that balance down to zero. Even if you pay off a credit card with a relatively low balance, it will make that debt pile seem a little less overwhelming. From a money-saving standpoint, it makes more sense to pay off the credit cards with the highest interest rates first. But those cards may have higher balances and take longer to pay down. Prioritizing paying off small-balance cards in full, otherwise known as the snowball method, gives you valuable momentum that encourages you to keep chipping away at other debts. This one won't give you an immediate self esteem boost, but it will make you feel awesome if you are patient. Select a popular stock or common index fund and buy a few shares. The size of the investment does not matter here. A few hundred dollars invested will suffice. Leave the investments alone for about three months and check the price. In most cases, you will find that the investments have risen in value since you bought them. Congratulations! You just made money as an investor and you hardly had to do anything. I am not a big fan of schadenfreude — that is, the act of getting joy from the suffering of others — but you can feel a little bit better about your own financial problems when you realize that few people are free of money stress. Household debt is practically ubiquitous. Student loan debt is common. And no one feels like they have enough saved for retirement. You may be stuck in a job that doesn't pay great and you feel like you are struggling to make ends meet. You've cut expenses, but things still don't add up. This is where you need to find creative ways to make extra money. When I used to work in the city, I would pass a coffee shop on the way to my office. And I would frequently stop in for an overpriced Americano. I knew it was a waste of money — we had free coffee at my office! — but it was a habit. One day, I decided to challenge myself to keep on walking. I looked straight into the window of the coffee shop, but did not go in. I missed the caffeine pick-me-up, but also knew that I just saved myself $3.50. Over time, that $3.50 a day turned into hundreds of dollars saved. And I got an ego boost from staring temptation in the face and walking on. This may seem counterintuitive. How can you give away money if you are struggling financially yourself? But donating money to a cause will make you feel better about yourself in general. It's also likely that the amount you give will make a big difference to the recipient and won't ultimately impact your own finances too much in the long run. Searching for bargains can be exhausting, but it can feel rewarding when you score a big one. It's a nice feeling to get $200 knocked off the price of a new refrigerator. You feel awesome when you find a gallon of milk for $1.19. And buy one, get two free on boxes of cereal? Score! Your credit score has an enormous impact on your finances, as it dictates how much you can borrow and at what interest rate. If you have a bad credit rating, you may feel like you're in a terrible spiral. Your credit rating is bad because of your finances, but you're having trouble improving your finances because of your credit rating.